With entertaining, singable songs about friendship, self-esteem, assertiveness, Friendship Stew serves up a rockin' good time, yum, yum. Includes extra fun and educational activities on CD Rom. Listen to a clip of the song on this page. 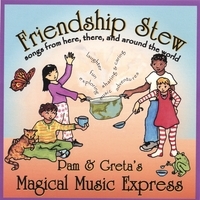 Pam Donkin and Greta Pedersen formed Magical Music Express in 1983. They are award-winning recording artists, music specialists, educators and performers. Their music is licensed to Scholastic Books and numerous video projects, and enjoyed in homes, cars, and classrooms across the US, Canada, and beyond. Their warm and humorous songs are filled with self-esteem, assertiveness, friendship and the zaniness of life. "Every classroom should have their songs! "These recordings are not just music, they're an integrated curriculum." "We just drove 1200 miles....and you saved our trip!" "Adults and children alike loved the Magical Music Express. You certainly have the ability to bring out the kid in all of us." Judy Edmonds, Ronald Mc Donald House, Palo Alto, CA. Best sounding children's CD that we own! Great vocals, great instrumentals. And the songs! "Be Yourself" and "Slimy Mud" are our favorites. My kids sing them all the time (and I don't mind!). We loved their Music is Magic CD so much, we bought this one as well. At last, we have TWO CDs our family can all agree on! Great for the classroom and home! This recording is not just music, it's an integrated curriculum! I recommend it to all my student's parents, for the home as well.